Books, Music, Articles, and More! Many people revere Aldous Huxley for his famous and most influential classic, Brave New World, a world in which people are born from machine and assimilated into a society that only focuses on the common good rather than individuality and personal sentiments. 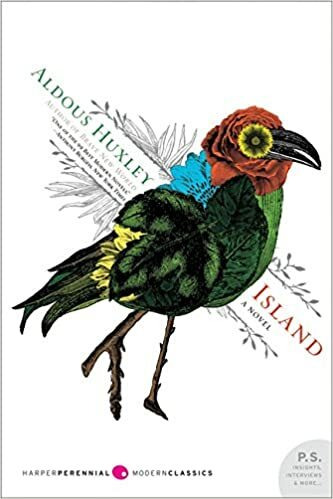 Thirty years later, Huxley released a novel about an island nation, Pala, that exemplifies what you would imagine a perfect world would be. A society that is just happy, and avoids any doctrine or ideology, such as capitalism or socialism without hardly any adversities of modern society such as poverty, wars, corrupt governments, and crime. How is it possible for an is land to be so immaculate, with only a few essentials to life, such as education, family, sustainable food, and a few modest commodities. First of, Pala is a combination of Western and Eastern ideals. It wasn’t great until a former Calvinist but now secular doctor ,Dr. Macphail, who arrived and combined eastern philosophy with the science of the west to create a sublime and prosperous society. The ideas mainly deal with human nature and how to curb the malicious or disorderly conduct of individuals by prevention of dysfunctional behavior or mindsets by having an open community and open minds as well. One of the ways this works is the openness of the community to mutual adoption. This allows a child to have several different parents to support any child in need from parental conflict, abuse, etc, that may happen at home and thus shelter them until the relations have been restored. It sounds crazy to let a stranger or an acquaintance keep your child for a day or two while you sort your mess out, even to myself, but that’s the entire principle behind Pala is to look out for each other. Not only are mental illness is prevented but also disease is curbed from the acceptance of specific scientific endeavors, such as artificial in insemination. Dictators aren’t likely to overthrow the small island (at least from the inside) because with the rejection of western political philosophy, having assiduous child development, and due to simply being content and aware at every moment. It can be somewhat preachy after a few chapters in from the sheer amount of explanation touted by almost every character of what goes on within Pala but the author does make it interesting with antagonizing characters that censure the islands way of life. The character you follow, if you ever find this book and actually sit down and read, is from London who is someone who we can identify with as someone who is from a western society or just simply unfamiliar with spiritual and Buddhist endeavors. You find out he has a larger and potential sinister part of the fate in Pala. Overall I found this book to be a must read for people that are interested in books that examine society and the individuals within them.